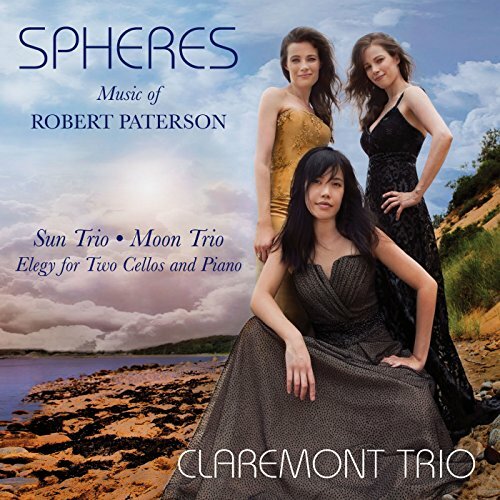 Spheres features one of America's greatest piano trios, the Claremont Trio, and consists of three trios by award-winning composer Robert Paterson: Sun Trio, Moon Trio and Elegy for two cellos and piano. The Claremonts are joined by their former pianist Donna Kwong on Sun Trio, and cellist Karen Ouzounian on Elegy. The entire album was recorded at the Academy of Arts and Letters in New York City and produced, engineered, mixed and mastered by legendary producer and engineer Adam Abeshouse. Robert Paterson and the Claremont Trio first became acquainted through Adam Abeshouse. Paterson asked, "which is the best piano trio you've worked with recently?" Without hesitation, Adam said, Oh, Rob, the Claremont Trio, of course." Paterson then contacted the trio, sent them a copy of his Sun Trio, and waited to hear back. Fortunately, they liked his trio, and agreed to record it for this album, but at the time, Paterson had no idea what the other works would be on the album. After recording Paterson's Sun Trio, the Claremont Trio suggested the idea of Paterson composing a brand new trio especially for their ensemble, and for this album, which ended up being Moon Trio. To round out the album, Paterson suggested his Elegy for two cellos and piano. All three of the works on Spheres are inspired by or have something to do with celestial bodies—the sun, moon and the cosmos. Moon Trio is the sister piece for Sun Trio, the other piano trio on this album. The moon inspires each of the four movements. The first movement, Moonbeams, consists of bright, cascading arpeggios that interact and overlap, creating playful rhythmic interactions between the three instruments. The second movement, Lunatic Asylum, is a highly rhythmic, mixed-meter scherzo that capitalizes on extreme ranges and timbral effects. The third movement, Blue Moon, is slow, hazy and dreamlike, and is built on long held chords and lush melodies in the violin and cello. The last movement, Moon Trip, is like taking a trip on a rocket ship. It begins explosively, contains an ethereal middle section, and ends solidly as the trio finally lands on solid ground. Moon Trio was commissioned by the Claremont Trio and Rick Teller. The idea for Sun Trio originated when I first began to score the soundtrack for a documentary entitled Journey Into Courage. After composing the opening music, director Bess O’Brien and I decided that it was best to change some parts in order to properly compliment the film. I never discarded the original sketches, even though much of it remained on the cutting room floor. Thankfully, the sketched could be put to good use with this work. The first movement, Sun Day, begins with the theme from the Journey into Courage introduction. This movement is meant to evoke feelings you get when summer, mid-day sunbeams appear from between the clouds and warm your skin. Sunset, the second movement, was inspired by Lake Champlain in Burlington, Vermont, and my wife Victoria. I envisioned us embracing, dancing a Tango under a multi–colored sunset—at times, to themes from Stravinsky’s L’Histoire du soldat. Victoria is a much better dancer, so in this movement, she teaches me the steps. I fumble around and finally get it right, and then the sun sets. The third movement, Absence of Sun, is connected from beginning to end by a long melodic line. The cello melody is modeled after a classical Indian Sitar raga, specifically, the traditional, slow introductory section of a classical Indian composition. The bass piano part supplies the drone, while a high-pitched tone row supplies a “starry night” texture. This texture gradually melds into a wind chime accompaniment. The movement peaks in the middle with an intense cello line. At this point, the violin intervallically supports the cello line. Each instrument—and in the case of the piano, each stave—represents a specific, individual texture. This movement is intended to sound somewhat improvised. Sunrise, is meant to evoke the feeling you get when watching the sun rise. There is a “Sun” peak of an octave, a bright yellow ‘E’, symbolizing the first, intense, bright sunbeam peaking over the horizon. In the middle of the movement, a string of rising chords mimics a “fast-forward” of the sun rising in the sky. Later in the movement, the violin and cello play decelerated bird motives. I wrote the bird songs down on the morning of April 17, 1995, while watching the sun rise behind the University of Vermont music building. I use the “mystic chord” by Alexander Skryabin as melodic and chordal material for the anticipation of the rising of the sun. While I was waiting for the sun to rise, I watched the mountains intensely. I finally was about to give up, thinking that the sun tricked me and rose behind some clouds when I wasn’t looking. As soon as I turned around to walk away, I felt an intense heat hit the back of my neck. I turned around and there it was: the sun, in all of its glory and splendor, lighting up the mountains. As well as evoking a sunrise, this movement also uses themes from the previous three movements. The sprightly Sun Dance closes the work and vibrantly contrasts the other four. The initial piano motive is taken from Five Movements for string quartet by Anton Webern. The first section introduces themes, motives and patterns that are then used in subsequent sections. The second and fourth sections are percussive, while the third section is more placid and melodic. The finale is hard and driving, utilizing both snap pizzicatos (plucking the string so it bounces against the fingerboard) and loud four-note chords in the strings. Sun Trio was commissioned by Dennis O’Brien to commemorate the 98th birthday of Helen O’Brien. After hearing my music, and in particular, my Sonata for Bassoon and Piano, bassoonist Charles McCracken asked me to write Elegy for two bassoons and piano in memory of his father, Charles P. McCracken, a well-known and highly-regarded cellist in the New York musical community. Since this piece references Bach’s cello suites and Charles Sr. was a cellist (and played principal with the New York Metropolitan Orchestra for two seasons), and the cello and bassoon have very similar ranges, I made this transcription for two cellos and piano, a version I think Charles Sr. would have appreciated. His only request was that I quote a work that his father loved to play, one of the cello suites by J.S. Bach. I also love Bach’s music, so this was an easy request. I quote Bach’s Fifth Cello Suite, one of his father’s favorite pieces, and also Bach’s Third Cello Suite, a work that Charles Jr. likes, creating a sort of father and son pairing of references. Charles and l also batted around the idea of incorporating a Bach chorale, but ultimately, this seemed unnecessary. Instead, I imbue a few sections with Baroque-sounding, choral-like textures. Although Charles describes his father as having been gregarious, fun loving and larger than life, this work is perhaps more earnest than humorous, but with a sense of playfulness in the way I manipulate the musical materials. Abstractly, Elegy is also about the loss of innocence from childhood to adulthood, and reflects on how many of us lose our sense of child-like curiosity and playfulness once we become adults. In this sense, I think this work is definitely for Charles Sr., as it seems that he had these traits all along. While writing, I also thought of my father, sculptor Tony Paterson. He likes my Sonata for Bassoon and Piano very much, and in particular, the Edison’s Ears movement, so much so that he dedicated one of his sculptures to me and titled it Edison’s Ears. Indirectly, I also dedicate this work to my father, who also loves the music of J.S. Bach, and who I love very much. I also thought of something my father once said, that it comforts him to know that life will go on after he’s gone, and this was pivotal, particularly with how I incorporate Bach’s music. Each quote starts out somewhat literally, but then continues on in the same style, but with different notes from Bach’s original versions. Additionally, there is a third quote toward the end from Bach’s Prelude No. 1 in C Major from the The Well-Tempered Clavier, Book II. This is one of three works of J.S. Bach—and the most works by any composer or musician—that were included on the Golden Record, a disc that was included on both NASA Voyager Spacecrafts 1 and 2 launched in 1977. I had a surrealistic vision of Bach’s music floating through space, as if the Voyager is singing to itself and to the cosmos, trying to keep itself company as it travels across the vastness of our galaxy. Incidentally, one of my favorite memories of childhood was of my father reading to me from pictures books and magazines that showed these wonderful spacecrafts, a tradition that I look forward to as a father. The Voyager spacecrafts are fueled by a plutonium fuel source. Due to radiation decay, this fuel will die out ca. 2020 and cause the Voyager spacecrafts to cease operations. I re-wrote the final Bach quote to sound like the music is also melting and decaying as the plutonium decays. In incorporating this decaying quote, I was indirectly inspired one of my favorite pieces, George Crumb’s Makrokosmos III, Music for a Summer Evening. The original Elegy was commissioned by Charles McCracken and Gordon Harris through the American Composers Forum and is written in memory of Charles P. McCracken. Lauded as “one of America’s finest young chamber groups” Strad Magazine, the Claremont Trio is sought after for its thrillingly virtuosic and richly communicative performances. First winners of the Kalichstein-Laredo-Robinson International Trio Award and the only piano trio ever to win the Young Concert Artists International Auditions, the Claremonts are consistently lauded for their "aesthetic maturity, interpretive depth, and exuberance" (Palm Beach Daily News). Gramophone magazine praised the trio’s “poetry and… thrilling virtuosity” in their Beethoven “Triple” Concerto with the San Francisco Ballet Orchestra, recently released on Bridge Records. Of their Beethoven & Ravel album, one reviewer raved, “These are some of the most impassioned, moving, and notable readings of these favorites that I have ever heard, bar none.” (Audiophile Audition). Their discography also includes Mendelssohn Trios, Shostakovich and Arensky Trios, and American Trios with works by Leon Kirchner, Ellen Zwilich, Paul Schoenfield, and Mason Bates. A collaborative album with clarinetist Jonathan Cohler garnered a glowing review in Fanfare magazine and received a Critic’s CHOICE award from BBC Magazine. The Claremont Trio’s recent seasons included engagements at Carnegie Hall, Kennedy Center, Isabella Stewart Gardner Museum, Library of Congress, Celebrity Series of Boston, Dame Myra Hess Series, Coleman Chamber Music Association, Johns Hopkins University, Austin Chamber Music Festival, Stanford Lively Arts, Kansas City Friends of Chamber Music, along with the Chamber Music Societies of Phoenix, Dallas, Sedona, San Antonio, Buffalo, and the Universities of Washington, Wisconsin, and Missouri. They have performed the Beethoven Triple Concerto with orchestras such as the Nashville Symphony, Wichita Symphony, Virginia Symphony, Pacific Symphony, and Utah Symphony. They also appear regularly at festivals including Ravinia, Saratoga, Mostly Mozart, Caramoor, San Miguel de Allende, Rockport, Bard, Orford, and Norfolk. The Claremont Trio has commissioned new trios by Mason Bates, Paul Chihara, Donald Crockett, Sharon Farber, Howard Frazin, Helen Grime, Gabriela Daniel Kellogg, Lena Frank, Nico Muhly, Robert Paterson, Sean Shepherd, and Hillary Zipper. They have conducted master classes at Columbia University, Eastman School of Music, Duke University, Peabody Conservatory’s Preparatory Division, and the Boston Conservatory. The Claremont Trio was formed in 1999 at the Juilliard School. Twin sisters Emily Bruskin (violin) and Julia Bruskin (cello) grew up in Cambridge, Massachusetts, and they both play old French instruments. Emily's violin is a Lupot from 1795; Julia's cello is a J.B. Vuillaume from 1849. Andrea Lam (piano) grew up in Sydney, Australia. The Claremonts are all now based in New York City near their namesake: Claremont Avenue. For more information about the Claremont Trio, please visit claremonttrio.com. Described as “a modern day master” (AXS) and the "highlight of the program” (The New York Times), Robert Paterson is praised for his elegance, wit, structural integrity, and a wonderful sense of color. The Classical Recording Foundation at Carnegie’s Weill Hall named Paterson Composer of The Year in 2011, and his music has been nominated on the Grammy ballot for the past four seasons. His works have appeared on National Public Radio’s Best of the Year lists for classical music and regularly appear on radio playlists across the United States. His music has been performed by over one hundred ensembles, including the American Composers Orchestra, Minnesota Orchestra, Vermont Symphony Orchestra, Austin Symphony, and the Louisville Orchestra. Recent performances include the world premiere of Ghost Theater, commissioned by the Albany Symphony’s Dogs of Desire (2015), and in 2016, the world premiere of Shine commissioned by the American Brass Quintet, Moon Trio commission by the Claremont Trio and Graffiti Canons, commissioned by the Volti choir in San Francisco. Recent commissions and recordings include Walt's America for orchestra and chorus by the Gulf Coast Symphony, Dark Mountains by the Vermont Symphony Orchestra, and I See You, performed by an all-star string orchestra conducted by Delta David Gier, with the JACK Quartet, Del Sol Quartet, PUBLIQuartet and the American Modern Ensemble. Having written over ninety works to date, Paterson has received accolades and won awards for his works in virtually every classical genre. His awards include a three-year Music Alive grant from the League of American Orchestras and New Music USA (2009-12), the American Composers Forum Jerome Composers Commissioning Program (2004), the Utah Arts Festival Commission Competition (2014), Cincinnati Camerata Composition Competition (2013), ASCAP Young Composer Awards (1998, 2000), and fellowships to Yaddo (2009), the MacDowell Colony (2003), Aspen Music Festival (1999), the Atlantic Center for the Arts (2000) and the Copland House (2007). Paterson holds degrees from the Eastman School of Music (BM), Indiana University (MM), and Cornell University (DMA). Paterson gives master classes at numerous colleges and universities, most recently at the Curtis Institute of Music, Aspen Music School & Festival, the University of Illinois Champaign-Urbana, New York University, and the Cleveland Institute of Music. He resides in New York City with his wife, Victoria, and son, Dylan. For more information, visit robertpaterson.com.